The networking of the “stock” airconditioning components is described in this post. Note that the radiator cooling fans are an essential component of the airconditioning system but will not be described here again as they were in the first post of this series covering current tracks 15 to 28 of the basic electrics. This diagram is slightly different due to the original being from another source and I’ve merged both of the pages covering these airconditioning components. 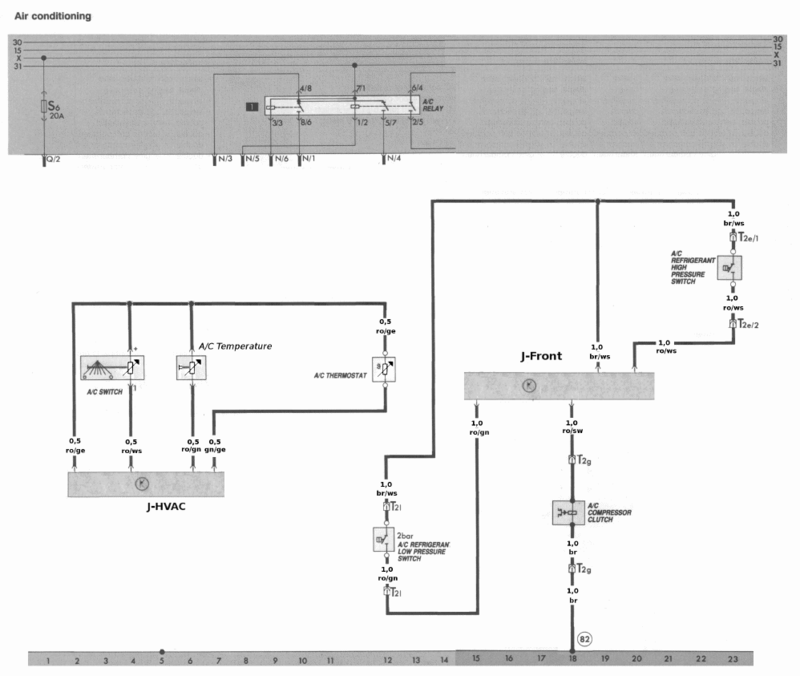 J-HVAC networks the upper A/C control slider in the dashboard (E39). The position decoding is by a potentiometer or similar variable resistance. Ex-factory, the slider implements logic for when the compressor and the ventilation fan should be running.The upper slider with the electrical contacts incorporates a manifold block for vacuum operation of the air distribution flaps while the lower slider moves an air blend flap to proportion the airflow through the heater for the “desired” air temperature. J-HVAC will electrically control the air distribution flaps via servomotors. It has to know which of the 7 positions is set. If all the positions can be identified using a variable or stepped resistance, then only 2 wires will be required. I’ve snarfed this picture of the unit removed from a vehicle. The A/C control head that has the contacts and vacuum manifold sits atop the top slider. J-HVAC also monitors the A/C “Thermostat”. 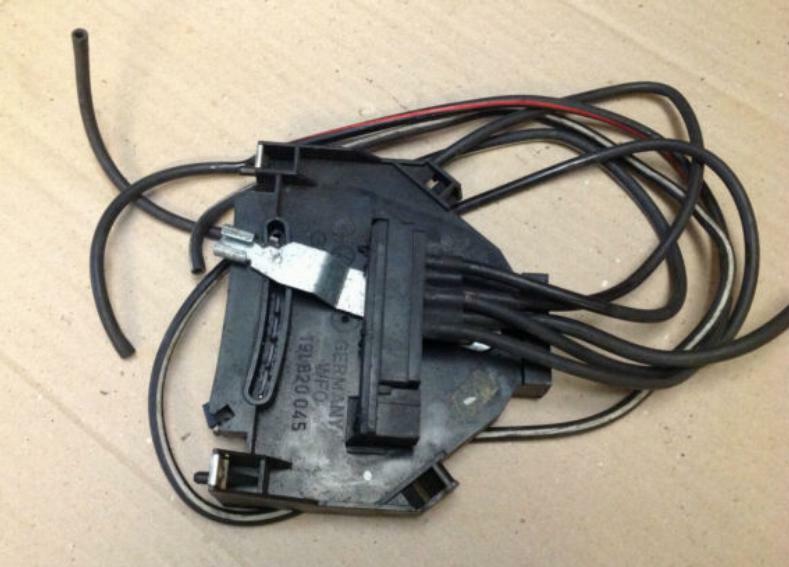 The ex-factory thermostat is one of the most expensive replacement parts of the airconditioning system after the compressor. J-HVAC make that obsolete by using an electronic temperature sensor in the thermostat’s location. The position of the lower slider of the control head is as a true temperature setting, with position determined by an added potentiometer. The blend flap is to be driven by a servo-motor to achieve the desired temperature by varying the flap’s position in response to changes in airflow, air temperature, coolant temperature and evaporator temperature. Untethering the control head from the Bowden cable also allows for it to be repositioned in the centre console, (almost) providing a double-DIN space in the dashboard proper. Control of the flaps and better management of air temperature involves the control of 3 standard distribution flaps and the warm air blend flap. Circuit details of that in another post. Intelligent operation of those flaps is best informed by a number of temperature sensors that can easily connect to J-HVAC using a 1-wire bus; in parallel with the A/C “Thermostat”. J-Front operates the A/C Compressor Clutch as needed; when it’s safe to do so. J-Front monitors the state of the refrigerant system via two pressure switches. The switches are wired with a common return, minimising the number of wires entering J-Front. Ex-factory, the radiator fan runs continuously at (at least) low speed whenever the ventilation control slider is in a position where the compressor might run. When the high pressure switch closes, it’d cause the radiator fan to operate at high speed. The low pressure switch guards against operating the compressor if the refrigerant pressure is too low. The Digifant unit needs to know when the A/C clutch is engaged. J-HVAC will “publish” the demand for the compressor, J-Front will note that change and publish that conditions are OK to engage the clutch as demanded. J-Central then proxies the compressor active signal for the Digifant unit and J-Front activates the compressor’s clutch. Also ex-factory but “ignored” in the diagram above, is the over-temperature switch mounted on the side of the cylinder head as it is redundant, with coolant temperature already known by J-Front and also by J-Central using the other coolant temperature sensor on the front coolant flange of the head. It may be beneficial to replace that switch with a temperature sensor so that the temperature at the side of the head can always be known fairly accurately. While the car is moving quickly (over 60 km/h), there is little point in operating the fans at low speed to help the condenser mounted in front of the radiator to get rid of heat. J-Front can use road speed and other parameters to operate the fan and compressor more intelligently.